Welcome to the final installation of the deadlift progression in the BridgeAthletic Building Blocks series. 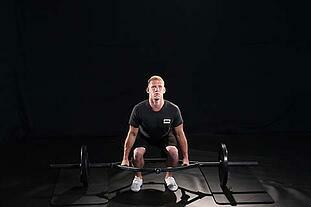 Today we will take on the pinnacle of the Deadlift progression - the Hex Bar Deadlift. We prefer to recommend the Hex Bar / Trap Bar over a regular barbell because It helps to decrease shear forces on the lumbar spine. This allows you to stabilize your shoulders in neutral and promotes proper movement mechanics, especially with taller athletes. Stand with your feet slightly wider than shoulder-width apart, toes rotated out slightly. Keeping your chest up and hips down, squat down and grab hold of the side handles. With a controlled movement, standup without locking out your knees. Slight pause. Control the movement as you return to the start position. Focus on not crashing the bumper plates into the floor. Repeat for prescribed reps in a controlled tempo. Bridge Tip: Keep your chest up and hips down, especially as you get tired. Do not start the movement by raising your hips. This puts pressure on your lower-back, making the movement similar to a back extenstion and not a full-body movement.